Industrial Machinery Market size was over USD 485 billion in 2015 with 5.3% CAGR estimation from 2016 to 2024. Incorporation of electronic based capabilities such as GPS (Global Positioning System) in agricultural equipment helps in interconnecting various other device in order to create a systematic approach, enabling technology to become a part of overall system of systems. Escalating need to harvest multiple crop types is expected to propel industrial machinery market size. These technologically equipped products aid in elevating productivity as well as efficiency. Furthermore, increasing R&D in various segments such as steering systems, data management, automation of operations and interface is likely to positively impact industrial machinery market share. Favorable regulatory norms regarding tax benefits for infrastructure ventures is likely to fuel the construction activities in countries such as India, Japan and South Korea. Increasing demand for products such as earthmoving equipment is anticipated to offer potential growth opportunities due to rapidly growing urban population. Excavators are mainly used in general grading/landscaping, heavy lifting, demolition, brush cutting with hydraulic attachments, river dredging and digging trenches. Heavy duty excavators are primarily implemented in heavy construction and mining industries. 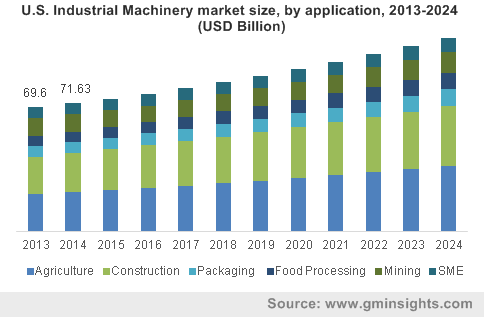 Rising prevalence of capacity augmentation in cement industry is forecast to catalyze the excavator market growth and thus fuel the industrial machinery market size over the timeframe. Risks involved in mining activities such as slope failures and rock falls is likely to hamper the industry growth. Surface mines are massive industrial sites where humans deal with huge and moving equipment. Factors such as blind intersections and obstructions as well as irregular road designs may also hinder the industry demand. Packaging machinery market size is set to cross USD 65 billion by 2024. Rising demand for packaged beverages and food owing to growing middle class population accompanied by urbanization will act as a key growth driver. Other factors include rising focus on achieving high efficiency as well as increasing demand for multi-functional systems. Modular systems are likely exhibit growth over the forecast timeframe due to high flexibility offered during the packaging process. Technologies such as EOAT (end-of-arm-tooling) design advancements and vision sensor constitute the key industry trends. Food processing machinery market share will grow at over 7% CAGR estimation from 2016 to 2024. Globalization in food manufacturing, rapid urbanization, and increasing disposable income will drive growth. In addition, liberalization of trade in agriculture & food, increasing awareness regarding food brands due to advertising by transnational corporations, along with growing demand for ready-to-eat food is expected to propel industrial machinery market size. Asia Pacific contributed to majority of the global revenue in 2015, primarily on account of the significant China industrial machinery market size. Burgeoning foreign investment for local production facilities accompanied by fused improvisation in food processing & consumer durables sectors are the major regional trends. Europe industrial machinery market share will grow at 4.7% CAGR estimation over the forecast timeline. Stringent regulatory norms regarding numerous aspects such as quiet operation, safety and limitations on exhaust emissions, play a key role in introduction of refined machineries. Sophisticated strut design has helped optimize the quantity of hydraulic fluid as well as orifice diameter. Moreover, it helps in reducing vehicle vibration level by about 50% when compared to conventional models. The advent of UAVs (small-unmanned aerial vehicles) such as drones are likely to prove effective in gathering aerial data as these devices fly below clouds, scan fields quickly and transmits data immediately. Integration of sensors in tractors is likely to prove highly instrumental for crop analysis, as these measurements exhibit minimal vulnerability to weather problems and also offer closest and accurate real-time crop assessments. On account of the diversified nature of the industry, major players differ on the basis of the product offering. Caterpillar, Komatsu, Hitachi, Volvo, Atlas Copco, and Terex represent key participants in the global industrial machinery market. In March 2015, Atlas Copco and Anglo American made headway in joint development of underground mining equipment, which is expected to be a significant example in innovative technology in mining industry. Technological advancements such as use of hydraulic engines and electric drives deliver increased efficiency in agriculture and in heavy industries. Various strategic initiatives are implemented to build strong dealer and supplier base to increase customer reach. The participating firms invest heavily in R&D to come up with improved performance. The manufacturing standards and safety norms are regulated by government and international authorities. The industry is characterized by adoption of environment friendly products for achieving sustainable growth. Several manufacturers offer facilities such as instalment loans and operating and financing leases, which offers the option to own equipment under lease. The leasing can be done on a full pay-out basis or by selecting a construction equipment leasing option, which allows returning the equipment or buying the equipment at a predetermined rate. Companies continue to make use of multiple options such as rentals, outright purchases, and leasing. Financing or leasing the equipment allows several contractors the benefit to stay on the cutting edge of technology. There is emergence of new tools in the industry, and leasing allows the users in utilizing the latest products available without bearing extravagant costs.